It’s sort-of shocking that this woman who was afraid to walk alone now craves it. As much as I miss being with Jerry, who still can’t walk because of a back injury, I love this quiet space with myself, God, and the blue sky. I awoke today with thoughts of Sabbath rest and have been processing all day. I exercised a lot this week, but feel a need to be more quiet today. I enjoyed lighting some candles and making herb tea (no calories!) and reading a novella. The guys were watching football, and I felt lonely. Decided to take a walk, not for exercise, but for rest and sunshine. I didn’t walk fast and only walked about a mile. I stopped often. Sat by a little creek. Enjoyed park benches. Eventually I ended up at a second tiny park, and listened to Scripture on my phone while waiting for the sunset. I think God is teaching me to be alone and content. Once back home I craved advent worship. I dug around until I found the advent candles I bought after season last year and put them out. Then I lit candles and found a hymnal with carols in it. 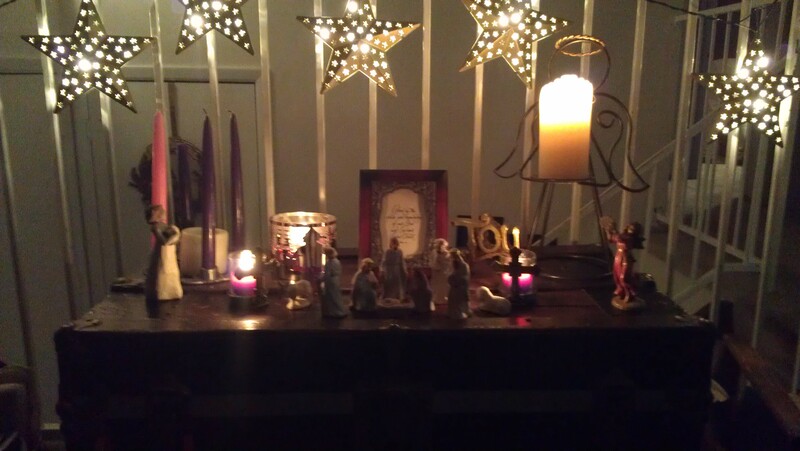 I sang for a while, read an advent devotional on-line, and longed for Jesus to come to me in a new way this season. It dawned on me yesterday that some of you may have not noticed I have a weight loss tips page at the top of my blog. Hopefully, you can get some ideas there. It’s simple stuff, like how licorice tea curbs sugar cravings, or that it’s good not to eat after 7:30. I’d LOVE to hear little tips that have helped you on your journey to a healthier, more slender body. And if you don’t mind me adding them to my blog, let me know.